I’ve heard mention from foreign travelers visiting Thailand that if you’ve seen one temple you’ve seen them all. This translates into that the similarities of Thai temples leaves one with the impression that there are really no major differences between one temple and the next. On some level this is true. All temples have Buddha’s inside them, and the deities carved on doors and window panels as well as mural paintings depicting the life of the Buddha do in fact bear a strong resemblance. But in truth, Thai temples do have remarkably pronounced differences in their design and architectural nuances’ giving them a distinct quality which makes visiting them a very gratifying experience. 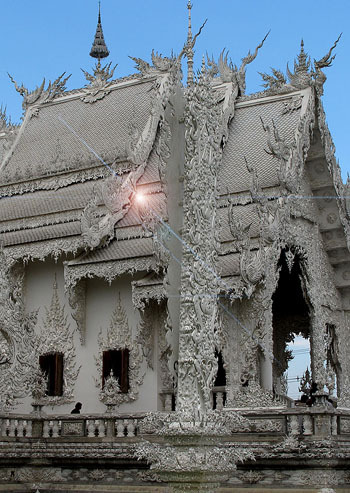 However, when visiting Wat Rong Khun in Chiang Mai one has to immediately arrest any notion of comparison with any other Thai temple for although the shape of the ubosot (main temple) is familiar in appearance, which would lead one to believe it’s only another variation of all the other Thai temples, that preconception immediately dissolves when a closer inspection of any part of Wat Rong Khun comes into focus. How, one could ask, could a temple be so different from any other temple? What would be so apparent making one temple different from another? The first and foremost difference of Wat Rong Khun is it’s all white, pure white and radiating with pulsating sparkling reflections created from the sun that shines on small mirrors imbedded into all the surfaces creating a silent fireworks display of natural twinkling lights. So, on my first visit to Wat Rong Khun, when I stepped out of the vehicle to see the temple, I could not quite adjust my perspective to get the temple to fit into a pattern of just another variation of a Thai temple. Something was very different, so different in fact, that there were no past precedents that I could rely upon to interpret the presence of what I was looking at. On second glace, and upon closer inspection, it seemed like a fairy tale image or even something built for some other world. The temple definitely did not fit into any previous impressions that I had thus far seen of temples in Thailand. Not only was the temple white, but it also had an electric like charged aura to it as if the temple were an entity that became suddenly shocked or saw some strange apparition seeing as everything was accentuated with finely crafted details with curling ends with very sharp points and small shiny mirrors embedded along all its sides. The temple was so charged with its own shapes of spirals and pointed ends of serpent tongues that it became an instant oddity and a magnificent reality to behold at the same time. It would be safe to say that the temple had an other worldly quality to its presence when juxtaposed against the hills in the distant West as if it had appeared for only a short moment and then might just as quickly fade away as some strange mirage appearing so convincingly with its nature that you thought you saw a temple but in fact were having a momentary hallucination. But it was not a hallucination for here was a temple quite unlike any Thai temple I had ever seen before, and with all the Khmer temples both in Thailand and the neighboring countries to see a temple so different, yet still being a Thai temple, there must be some factor that was so extant to cause such a difference in the temples appearance. 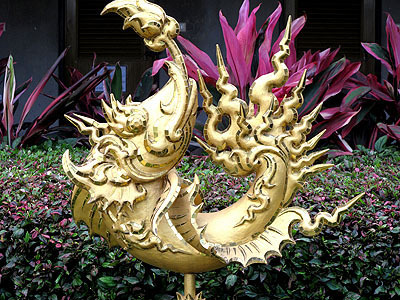 This other worldly appearance, in fact, originates from the creative genius of a Thai artist who has been gifted with an insight into worlds beyond worlds. If ever there was a reincarnated spirit of an individual from a past life into this time I would have to say that the 15th century artist Hieronymus Bosch would be as close as I could think of. There exists a sublime haunting feeling when one looks at the mythological animals propped up in a garden with demons and guardians which seem to be everywhere appearing instantly from their almost white invisible landscape becoming defined as shadows as the sunlight creates gossamer undulations in a hundred different directions defining their existence. The eye becomes hypnotized trying to find new arrangements of shapes and Buddhist imagery causing a constant turning of the head to follow one image into the next, but for the sake of not appearing epileptic with a constant jerking of the head, to determine if seeing is believing, a trance like state overtakes the mind knowing there is no conceivable way to comprehend all the visible aspects of the temple but instead to just allow a trusting meandering state to unfold and follow the path set out on the temple grounds leading inexorably to the main temple (ubosot). Eventually one does make it to the main temple being drawn not only by a sense of curiosity, but also by a magical path which feels built into the experience of visiting the temple. Wat Rong Khun not only attracts tourists by the thousands, and not only has it become a national landmark, but once on the temple grounds there is an overpowering feeling similar to what I once experienced walking under the apse at Chartres Cathedral in France. 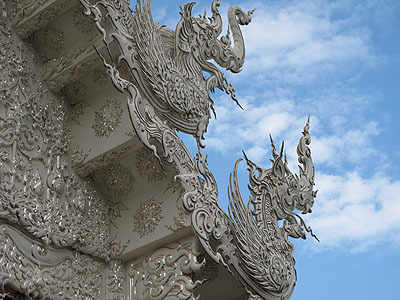 Here on the open plains of Chiang Rai resides a spirit impregnated into a white temple with a design that speaks as if it were from a godly plane of existence. Approaching the main entrance to the temple is like a rite of passage that needs to be completed. It is difficult to describe the feeling once having entered the temple grounds. Imagining what could be seen inside the temple preoccupies the mind to the point one would find oneself if running wildly to see the heavenly host sitting on some cloud in a mythical kingdom. That doesn’t happen, however, the anticipation to reach the temple is so great that it heightens the awareness of all the artifacts along the way. A white Buddha surrounded by flaming golden spires flowing everywhere makes fantasy appear real and on top of the temple of fantasy is the purity of the temple in all its shimmering whiteness and solemn recognition that it is indeed a very real temple. Both these aspects, fantasy and reality, present themselves so one is left with a new interpretation of holiness and a new approach to the divine no matter what faith one come from. 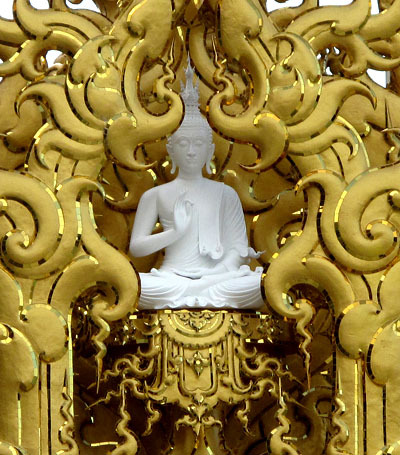 Wat Rong Khun makes the statement that it is a trans-Buddhist temple capable of transcending preconceived notions of a Buddhist temple allowing a new and fresh experience to take over ones sensibilities. But with all these thoughts and wonders swimming in my mind the entrance gets closer and closer and a feeling that there may be the possibility of not being able to go inside. The utter beauty mixed with some unknown sacred world combines to give the impression that a new holy experience is about to take place. Crossing the threshold into the main temple one is immediately struck by a multiple Buddha altar set within golden flames similar to the one outside the temple with upright tall while pillars reaching to the top most part of the celestial world of the inside of the temple. 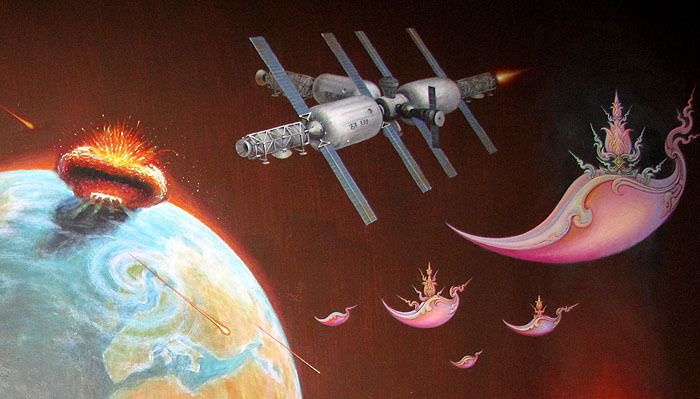 Then a shock of reality assaults this mystical world created by the journey leading into the temple for there, on the temple walls, can be found images of our own world complete with space ships, superman, Neo from the Matrix and devouring monsters annihilating the world we come from. Thrust into some grotesque fiery hell burning and displaying the sins of our profane existence is when I became stationary as I felt the flames licking at my heels. What do you say when all hell breaks loose before your eyes in a supposed serene Buddhist temple in the bucolic countryside of quiet Chiang Rai? Who perpetrated this grotesque imaginary world that at once captures your interest and in the next destroys your vision which became hypnotized by artistic delights? The end of the world opens up and the end times are being enacted among the wrathful deities of the peaceful heaven you once thought you were in. Here resides Bhairava (terrible Shiva) with all eight of his terrible aspects being fully displayed. 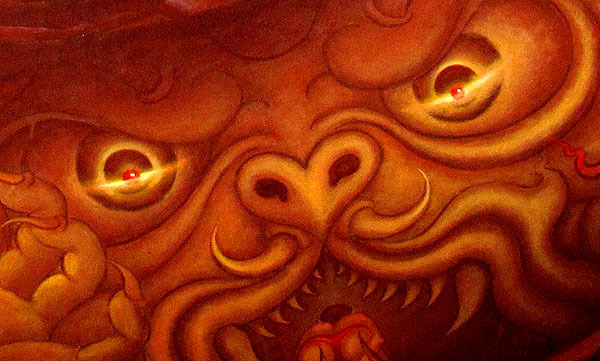 Monster serpents belying size and proportion mixed with tusk like teeth impaling the world we come from with our own heroes in the fray looking infinitely small compared to the cosmic wrath of Shiva’s angry manifestations. The images are graphic, extremely well executed down to the finest detail, even fractal in nature, and they all combine to effectively assault the senses in such a way that again one finds curiosity mixed with the same sense of devouring as the images are not only painted in seductive vermilion and carbuncular realism, but each image is embedded into the next creating a portrait of annihilation. The mind is sucked into total submission and one can feel the dissolution of self in a maelstrom of despicable and lascivious acts. Within this space of the holie of holies, with golden flowers surrounding a peaceful white Buddha sitting in front of an even larger Buddha who is surrounded by angelic deities floating in some celestial kingdom, the wrathful deities on the opposite wall, with coiled tentacles and elephant tusk shaped gnashing teeth, are devouring the profanities of our own modern contemporary world. 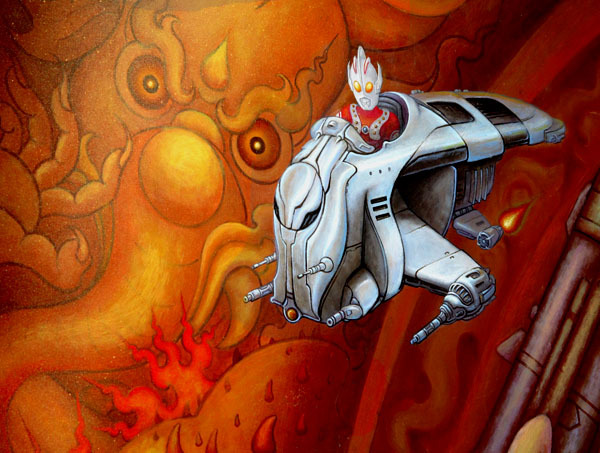 With ancient wrathful monsters destroying the injustices of the contemporary world our familiar heroes appear paltry within the calamity of destruction jumping out from the mural and into the senses. 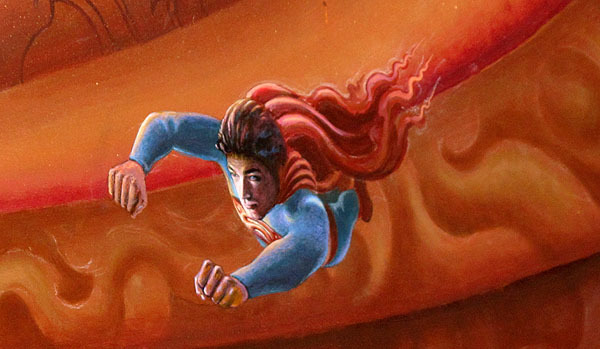 Through the maelstrom of fire and cosmic explosions with his cape shredded in the same fashion of the temple architectural motifs is superman looking helplessly lost against this background of crimson havoc. Mixed in with the scene of an Armageddon like world with devouring monsters and countless space ships originating from every time imaginable as they fly throughout a catastrophic landscape annihilating planet earth we are forced to contemplate our fate living in the 21st century? And appearing, as if there were no calamity at all, are Bosch like floating ships from a kingdom where peace and serenity must be the norm as they calmly pass all these horrific portrayals of our world that are being completely subjugated and destroyed leaving one with a haunting feeling that maybe the kingdom of the gods has begun its dissolution and is observing from afar the necessary elimination of all those elements that have punctured the peace of heaven where only gods reside. Standing transfixed, it was easy to feel the fire on the walls as a war with insect like flying machines with pilots appearing with plumes of metallic hair, pink floral like space ships reminiscent of Bosch’s triptych “Garden of Delights”, and with all the other space ships there was one space ship that was destroying the one symbol which separated the kingdom of heaven from the earthen kingdom; an attack by a laser beam on the symbol of time aiming at a wrist watch impaled by a monster’s gigantic tooth. The sun could be seen filtering through the temple windows and there was an eerie sense of trying to escape the maddening panorama of hell on earth and return back outside into the sunlight. But, once back on the temple grounds, a place that first filled one with a sense of fantasy and curiosity, was now turned into a strange and foreboding world that may not be too far away. For all the spectacular purity which existed outside the temple before, its uniqueness now became more poignant with hidden meanings. The realm of the gods was fully aware of the misdeeds of the human race and with all the images we carry with us daily, generated from our mediated world, the celestial forces and gods were eradicating them one by one inside the ubosot at Wat Rong Khun. Our own psyche becomes cleansed of the innumerable images that were somehow lodged in our memories and the gaze and peaceful countenance of the Buddha brought peace back into the insanity which has grown in our minds enabling us to find each and everyone of those personal demons when our eyes scanned the mural walls looking for all the familiar icons of our age as we witnessed their destruction. 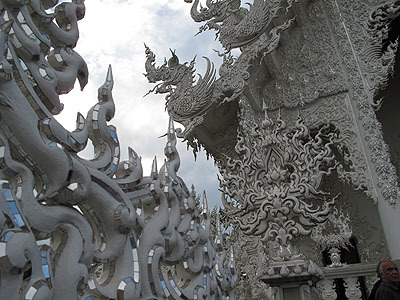 Wat Rong Khun is much more than a temple; it is a purifying experience of the most cosmic proportions. Wat Rong Khun is the single largest confessional ever built for inside all our sins are exposed before our eyes and washed away in the golden halo of the Buddha’s supreme image. And who could create such a temple? What sort of a Antoni Gaudi , the Spanish architect of La Sagrada Familia cathedral, could have landed on Thai soil with the artistic talents of Bosch and the wisdom of the Buddha to bring into existence such an iconic edifice affecting the body, mind and spirit as would a pilgrimage to Lourdes, France? What person was commissioned by King Bhumibol Adulyadej of Thailand to create royal medallions to be presented by his majesty to honorable subjects, and dedicated himself to a selfless existence to labor with his own earnings to create the white temple known by all Thais and thousands of visitors abroad? Chalermchai Kosipipat is that person, and with a dedicated team of artisans continues to add to the temple grounds his imaginative genius while maintaining the mindset of humility and a steadfast devotion to king and country. After leaving Wat Rong Khun one can feel assured they have been in some way affected by Kosipipat’s devotion and be inspired and comforted in knowing that ones sins were washed away and a blessing of unexpected proportions filled every cell of ones body. And how many people of today could try and build a temple for the gods and contribute to the life force given to us by divine intent? Chalermchai Kosipipat has, and he leaves with us a piece of his own way of thinking which everyone could emulate to purify a planet obsessed with war, avarice, greed, exaggerated pleasures and hedonistic pursuits. In closing this tribute to an exceptional artist and spiritual soul I would like to offer a quote from Chalermchai as an example of his way of thinking and his steadfast devotion to the spirit. “I would like to be a worthy citizen of the country, to be the best example for posterity to be truly aware of the love for the nation, the religion and the monarch through concrete actions. One is suppose to be born to build the nation, not to be born with avarice to cheat on the nation and one’s fellow countrymen for personal gains and those of one’s relatives and friends. I highly recommend a pilgrimage to Wat Rong Khun in Chiang Rai, Thailand to experience for ones self the genius of Chalermchai Kosipipat, and the spiritual message that is being offered to the world.